Milk is important for the full and healthy development of our children. Whether it’s expressed milk and formula milk when they’re little or cow’s milk once they’re toddlers (after 12 months), there’s nothing better than the Cow Cup when it comes to encouraging children to fill up on this source of goodness. This Cow Cup features a single piece, easy to clean spill proof valve that you can easily remove to make the cup free flow when you want it to be. The caring bunch of designers positioned the bite-resistant spout in a way that makes it easy for your baby to take a drink. What's more, it will help to prepare them for self-feeding. Large 325ml volume to suit even the most thirsty toddler! 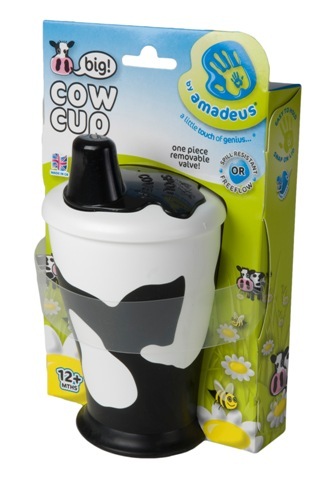 Click the button below to add the Amadeus Black Cow Cup to your wish list.